For all its schmaltzy graphics, the Independence Day is beautifully presented in 1080p resolution that really makes the explosions fill the entire room. It's been 20 years since Bill Pullman (American Ultra) uttered those now famous words "Today we celebrate our independence day", and made the world fall in love with a new, timeless classic movie – Independence Day. Now, in anticipation of this summer's sequel, Twentieth Century Fox Home Entertainment has released a special anniversary edition Blu-ray. As the tag line states, "We've always believed we weren't alone. On July 4th, we'll wish we were." It was a normal summer day when, suddenly, alien space crafts appeared in the sky over the major cities of the world. Not knowing what they wanted, the world had no reason to fear them and, in fact, many individuals celebrated their arrival. However, David Levinson (Jeff Goldblum; Jurassic Park) found patterns in the satellite signals interrupting the TV broadcasts everywhere and realized those ships were counting down. To what, he didn't know. Meanwhile, Captain Steven Hiller (Will Smith, Men in Black) of the Marine Corp was looking forward to a quiet Fourth of July holiday with his girlfriend, Jasmine (Vivica A. Fox; Empire), and her son. All that changed, though, when the aliens descended and he had to report back to base to find out what was going on. He eventually ended up volunteering for a once in a lifetime assignment to save planet Earth. For 1996, Independence Day was made with the best technology out there and was one of the last films that used actual models that were blown up to create many of the special effects. In fact, the movie won an Oscar for special effects. By today's CGI standards, the effects would be considered subpar and laughable, but, 20 years ago, they figuratively blew audiences away and added to the suspense and excitement of what became a summer blockbuster. The acting is excellent and it's no wonder this film made Will Smith an even bigger start than he was previously. Known as the comical nephew on The Fresh Prince of Bel Air, Independence Day showed a slightly more serious, adult side of Smith which opened more prestigious acting roles. Pullman delivered his iconic speech with all the bravado one would expect from a world leader, and Goldblum and Judd Hirsch had a nice father and son chemistry. For all its schmaltzy graphics, the film is beautifully presented in 1080p resolution that really makes the explosions fill the entire room. The DTS-HD Master Audio 5.1 enhances the viewing experience for the audience, giving the overall feeling of an invasion and annihilation of the world come to life. The extras are mostly from the original VHS release with a few additions, including an alternate ending, cast interviews and a featurette with scenes from the upcoming sequel. Honestly, the most interesting part is to see how the cast has aged. Even though the film is a completely cheesy popcorn movie, it became a huge hit and is iconic. The sequel is going to be one of the summer's most anticipated movies, and fans of the original should get this Blu-ray and watch it to remind themselves what they loved about the original. 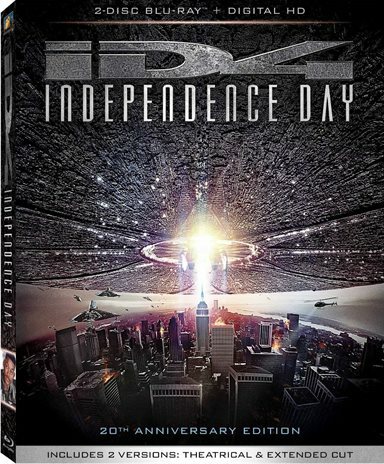 Download Independence Day from the iTunes Store in Digial HD. For more information about Independence Day visit the FlickDirect Movie Database.